As the summer season kicks into high gear, more South Jersey residents are looking to breathe life into their winter-ravaged backyards and transform them into gathering places for family and friends to enjoy. If you yearn for a more serene, fun and functional outdoor space, now’s the time to make that dream a reality. SLS Landscaping of Lumberton is in the business of designing, building and maintaining incredible outdoor living spaces. They have been serving South Jersey since 1992, creating both residential and commercial exterior spaces customized to each owner’s specifications. 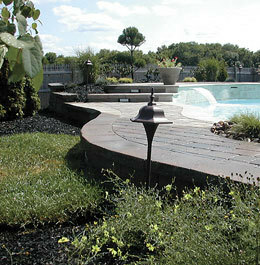 Their ultimate goal is to provide customers with a healthy and thriving landscape. One of the newer trends in home and landscape design is moving the comfort and convenience of indoor living to the backyard, and it has never been easier or more rewarding. SLS Landscaping works with homeowners to make that transition. Steve Stranz, SLS landscape architect, enjoys the challenge of working with homeowners to achieve an outdoor landscape that satisfies all of their families’ needs. As well, water features, such as a waterfall lit by low-voltage lighting, are popular among those seeking outdoor serenity. “Our customers work long hours at stressful jobs,” Stranz explains. “They want their outdoor space to mimic a tranquil oasis.” A soothing waterfall accented with strategically placed lighting can make all the difference in reducing your stress, while keeping energy bills in check. SLS Landscaping is located at 641 Eayrestown Road in Lumberton. They can be reached at (609) 518-5263 or SLSLandcsape.com. Published (and copyrighted) in Suburban Family Magazine, Volume 2, Issue 3 (May, 2011).